Softness wrapped in comfort, inside plushness, laced around your feet. Featuring Brooks brand new cushioning technology, DNA LOFT, the Glycerin 16 is engineered to provide a luxurious feeling underfoot without losing responsiveness and durability. The 16th version have got to be the best yet! The Glycerin 16 are the first to use the DNA LOFT cushioning that has recently been introduced. 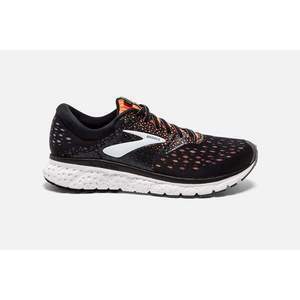 It’s Brooks’ softest cushioning to date, made from a mix of foam, air and rubber to react quickly. The DNA LOFT transition zone makes every move from heel to toe incredibly smooth and they have also fitted the 16’s with an internal sock liner that fully wraps the foot to adapt to your stride. The shoes final refinement is a smartly engineered Double Jacquard Mesh upper in a black colour that is a stylish upgrade from previous models. Not only is this aesthetically pleasing but the 3D print technology is infinitely breathable and stretches to adapt to the movement of your feet enhancing the fit and feel.